Yelena is currently a senior associate with Jump Capital. Prior to joining Jump, Yelena was an investor with MK Capital, where she sourced new opportunities and actively supported MK’s portfolio companies. As an investor with MK Yelena made investments in enterprise software, cloud computing and marketing technology. Previously she was an associate with McNally Capital, where she focused in energy and closed an investment in the clean energy space. Before business school Yelena was the finance manager for DreamWorks Studios, where she was actively involved in negotiating the studio’s raise of new capital and the adoption of a new global licensing strategy. 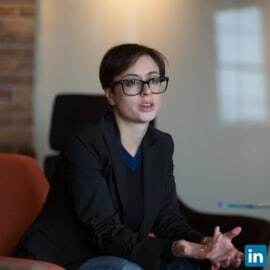 Yelena began her career as an investment banker with UBS, where she advised companies in technology and media and raised over $1 billion in capital for clients.